Attention, all graduating Div III students! We know there’s a lot going on as you finish up your Div III, between holding your exhibition or presenting in the Div III showcase, talking with advisors at your final pass meeting, and ringing the bell! At some point once you’re finished, we wanted to remind you to spend a few minutes to archive your Div III in the library’s Archives and Special Collections, and add your voice to history! We can accept your Div in whatever form it might take, from a digital PDF or multiple different kinds of files, to a physical object such as a portfolio or photobook, or even a full-size video file. Physical versions are included in the Library Catalog, and digital versions are searchable in our Digital Collections. You always retain the copyright on your own original work, and you can also decide the level of access you want to grant (Do you want your work to be readable by the general public? Or, do you want to limit it to the Hampshire community only?). If you have questions or hit any snags, you can email archives@hampshire.edu, or ask Robin Nolasco or Emily Moran if you see us around. 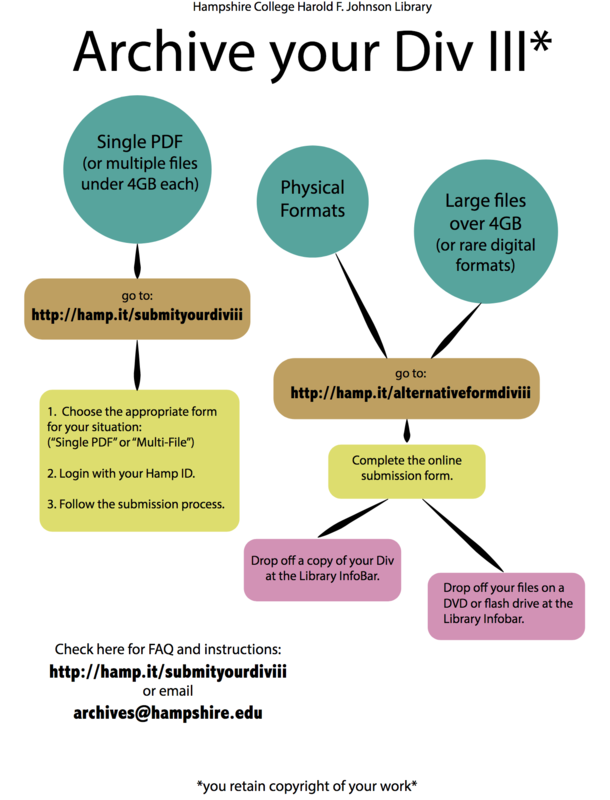 To get started, visit http://hamp.it/submityourdiviii for more information, submission forms, and FAQ.